Create a shortcut to the game on the Windows 95/98 desktop. Then, use the Settings/Control Panel/Display/Effects options to turn on "Large icons". The desktop icon for the game will turn into a new graphic. Access the PipBoy and stay at that screen to eventually see the old Fallout screensaver on the PipBoy screen. Hold [Shift] and click on the "Credits" button to hear various comments from the development team. After completing the game, go to New Reno. Find the man in the church and talk to him. 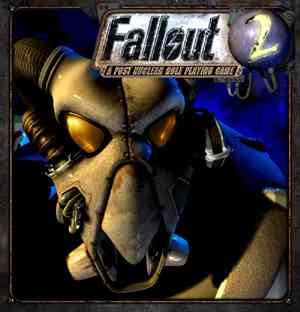 He will say thanks for killing the Enclave and will give you a book called the "Fallout 2 Hint Book". Every time you read it, you will gain 10000 experience points. After the first time you read it, all of your skill will go up to 300%. You can read this book as many times as needed and it will never go away. Go to the "Broken Hills". Walk to the right until you reach the screen where the miners are waiting for you to clear the mine. Walk into the mine and then run straight to the right. Do not t worry about the rocks that seem to block your path, they are there just to make you think it is the end of the road. If you walk close to them, you can see that you can walk past the rocks. There is a man in there who is not aware of the year. Wake him up, and when he has ran out of the mine, walk up to the footlocker and get the ore out of it. Walk out of the mine and back to the first screen. At the bottom of the screen just below the traders lies the "Broken Hills Ore Refinery". Walk into the refinery and talk to the head ghoul (he is in the office). Sell the ore to him, and then sleep for 25 hours. After waking up, talk to the ghoul again to get your ore back. He will ask if he can buy the ore because the city needs it and will offer you your $1000 plus an extra 500. Take the $500 extra and then talk to the ghoul again. If done correctly, he will make the offer again. Take the money and then talk to him again for another offer. Repeat this to get as much money as needed. Make sure never to give it to him for free or settle for the $1000. If you do, the offer will not appear again. Note: This trick may not work if the game has been patched. In San Francisco, go to the Red 88 gun store and steal all of the owners money (usually a couple thousand). Go to the item store across the street and steal all of his money. Then leave the city for a couple days (or a week in pipboy time). Then, return and once again steal the money that they have. This trick can be done as many times as needed. In San Francisco, the shopkeepers have money in their inventory that you cannot normally steal. To steal it, trade your money for an equal amount of theirs. Then, use the Steal skill on them. You now have more money. Visit Joey, the thug who sells Jet in Den. Drop all your money on the ground beside him and try to buy Jet. He will tell you that if you do not have the money to come back when you do. Answer "Wait, I'll buy it" and then close out of the dialogue. Repeat this until you have all the Jet you want. Then, steal the money that you should have given him -- he will have $500 for every jet purchase. Then, pick up the money again that you dropped on the ground. Note: This procedure involves changing a game file; create a backup copy of the file before proceeding. This trick is best done when you have a lot money. Go to your hometown, and find a box, vase, or other container. Put all your money in it. Save your game and remember the number of slot number you saved it in. Resume the game, take the money out, and save again, this time in a different slot. Remember the number of this slot as well. Exit the game, and enter the game folder. Enter the "datasavegame" folder. Open the folder whose name corresponds to the first save slot, and find the file "arvillage.dat". Copy this file, and then go back to the "datasavegame" folder. Go to the folder whose name corresponds to the second save. Select "Edit" then "Paste", and then select "Yes" to copy over the original. Resume the game and load the first game save. Open the chest and you now have double the money. Take the money, save over your first slot, and try again. Go to the second save slot, open it, and copy out the "arvillage.dat" file. Paste it into the first save slot, and select "Yes". You can do this as many times as desired. Go to NCR and go right to the power plant and talk to the girl. She will ask you to talk a man out of blowing up the power plant. However, when you talk to him allow him blow it up. The girl will want you to fix the reactor. Do it and she will give you some manuals. You can keep repairing the reactor and keep getting science and first aid books from her. Every time you fix the reactor, you will get 3000 experience points. The following trick works well if you have a high Steal skill. When you steal something, you get 10 experience points. When you steal two things, you get 30, and 60 for 3 things, etc. Basically, steal experience increases exponentially per item. Plant some money on someone, and then steal it all back, one coin at a time. Assuming you do not get caught, you can easily rake in experience points. After the game is completed and you have at least 130% in Science, go to the vault in Vault City. Go to the computer on the first level in front of the doctors' "office". Use the Science skill on it and the game should give you the option of scanning the medical files or something similar. Scan the files, then do it again. It should give you some information on the medical research done in Vault City. Scan the files a few more times and it will give you information on armor implants. Keep scanning the files and the computer will get "upset" and say things such as "There is nothing left" and "Why are you doing this?." After a few more times it should say "Fine! The big secret is on the main computer on the third level!". Go to it and reformat you Pip Boy (follow the directions the computer gives you). Then, go to your Pip Boy and read the message that the design crew leaves you. It should instruct you to go to the computer on the upper left of level three. Access the computer to get 20,000 experience points. Keep accessing the computer to get that amount each time. Note: A high Steal attribute and being dark helps with this trick. After you have found Vault 15 and have gotten rid of Dorian and his people in the vault, check his computer and make a holodisk of a spy at the NCR. So, go to the NCR and go to the presidents office. Once there, talk to the ordinary looking man in the outside office and tell him the spy information. He will say something and walk off. Proceed to the main room and talk to the man in the tuxedo. Tell him about the spy named F, then show him the holodisk. He will then give you $4000 and you will get 4000 experience points. Now here is the trick and it helps to have a high steal. Get to the side of him and steal the holodisk back. Then, tell him about the spy and show him the disk again. You will receive the money and experience again. Repeat this process until reaching the desired level. Note: Save often between attempts. Use a gauss pistol or rifle and target his weapon arm. After you cripple it, he will not be able to shoot you with his dual plasma gun. He will then melee you, can only do about 10 damage per hit. Hit him in the groin to bring him down so you can do more damage by hitting him in the eyes. Kill the president and take the presidential pass. Once you have done everything else and you are at the end Boss, talk the squad into joining your team. This may or may not work depending on how many people you already have and your charisma. Use the Sneak skill and hug the wall along the bottom of the screen and make your way left until you get to the computer. One of the options is to make the guns shoot at your enemies. Walk up to him and start to fight. Each drone gun will shoot at him, plus the squad you convinced. Gain a level and wait for the screen with the perks to appear. Highlight the perk and click "Done" on the perk screen. However, click "Cancel" on the main screen. Click back to the character screen and the perk screen will appear again. Repeat these step to gain unlimited levels and 99 skill points. Give Mayron as many ingredients for the stimpacks and antidote as needed, and he will create them. Go to the starting temple with an established character. Place any item you want to start with in the pots and chests. Start a new game, go inside the temple, and save the game in any slot except for the one you moved the items from. Exit the game. Go to the directory in which you saved the game (slot01, 02, and so on). Move the Artemple.sav to the slot you saved the new game to and move the pre-existing game somewhere else. Reload the game and start the new game. Go to the pots where you placed the items and they should be there again. You can also get the power armor very early in the game by going directly south along the coast to San Francisco. You may have to save often, as enemies are too advanced to take on at this time. Go to either shop in San Francisco. Buy whatever you want, but pay for it in cash. Then, walk up behind the shop owner. You can steal your money back, plus his own. When you get to the Den, kill Tubby and Flick and take all their items. You should get a lot of Jet, Mentats, and other drugs as well as a lot of guns. When you get to the Den or anywhere else that has a graveyard, get a shovel and dig up the graves for rocks, beer, and ammunition. The only downside is that your karma will say "Grave Digger" and it may go down. Start a new game with a female character named Buffy. Get past the Temple Of Trials and go to Den. Talk to Rebecca. She will say that she recognizes you and give some items. The guards will not let you into the Vault unless you are a citizen. If you do not want to take the time to get the citizenship papers, go into combat mode then just walk in. This will not cause your karma to lower. When you are traveling across the world map you sometimes come across a small green circle that has only a bridge and a person blocking your path. If you kill him instead of answering his questions, you can get 7500 experience points and his robes which is good armor until you get the powered. If you answer his questions wrong, he hits you for over 2000 damage. To learn how to skin geckos, save Smilely the trapper in the toxic caves. Then, go to Klamoth and talk to Smilely at Buckners.